For 20 years, I have been writing to save my life. Using words as bandages to hide my scars, and heal the damage of past mistakes. I AM NOT PERFECT. But, to many, I appear to be. Spoiled. Entitled. Favored. Indeed. However, these synonymous terms do not equate to being flawless. My brokenness is still too painful to confront. For quite some time, I’ve been sitting, unbothered, on a pedestal that is now rusting and losing its quality. Secrets that I’ve locked away are beating against their cells, begging to be released. There’s no guarantee that I’ll be freed from the guilt if the world is invited in to examine my shame. So, I press forward meticulously, granting sneak peeks to those who have eased close enough to prove they care and work to gain my trust. I’ve developed a productive routine; keeping myself super busy to avoid pressing issues. Working myself crazy. Consciously and subconsciously creating intentional distractions that lead to a dark, secluded hole. Every now and then, I peep out for praise, for encouragement, for support. And crawl back inside, impatiently waiting for loved ones to dive in and inquire about my well-being. My visitors’ log is often empty. And I begin filling the blank spaces with more activities, until my calendar overflows with numerous to-do tasks that become almost impossible to complete. I struggled to recall long-forgotten childhood memories during my most recent therapy session. Vivid flashes of previous circumstances startled me. The agony was freshly felt as closed wounds were reluctantly reopened. My therapist peered at me and said, “You’re very layered. Peel back those parts to find YOU.” She was referring to the little girl I left behind years ago, when I somehow escaped reality to enter various dream worlds that welcomed me with open doors. This month marks one year of my mental health rehab. Soul-searching is a cyclical journey that often results in dead-ends. I’m too inquisitive to accept unresolved dilemmas, too persistent to forfeit chances at understanding. No matter how confident I may seem, I am constantly in need of reassurance. Selfishly demanding to be seen, heard, and valued—at my weakest points, wondering how an ounce of loneliness trumps the joy I have accumulated. 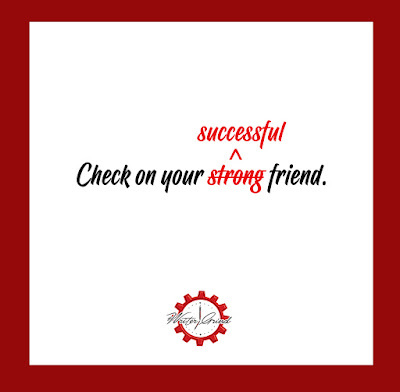 This blog serves as a reminder to check on your strong successful friend. Sometimes the smile is a facade to keep the judgment away. The accolades are just mounting pressure. She’s overwhelmed and trying hard not to disappoint those who look to her for inspiration. Fear of failure is a daily burden. She suffers in silence because public complaints are misconstrued as ungratefulness. No matter how passionately she prays, she is only acquainted with instant peace when resting her head on her husband’s chest; his heartbeat reminds her that she, too, is breathing. Someone is always depending on her to radiate resilience. If she quits, they may never seek courage elsewhere. She must push through, and pull them along with her. She’s not always tough enough to bear the weight. Instead of assuming she doesn’t require consistent check-ups because she ‘has it all’, consider how heavy the load is. Ask her which pieces she must immediately get rid of. Then, help her unpack and offer to carry half. Allow her to feel light again. Before she sinks back into that hole. Gets stuck. And has no strength left to climb back to the top. My chest tightened, signaling an oncoming anxiety attack. As my tears blended with the shower’s clear water stream, I realized that this unexpected mini breakdown was a necessary cleanse. I braced myself and washed off the worry. Secured a towel around my body. Looked in the mirror and stared at my reflection. Curved my lips into a smile and decided to compose this PSA, containing an initial sentence delivered with absolute truth: For 20 years, I have been writing to save my life. My purpose walk isn’t easy. I’m not sure why God covers me when I don’t follow Him. I didn’t ask to be chosen. Yet, I’ve never resisted the calling. I am well aware of the power that comes with simply being obedient, and believe without my gifts, I am useless. I’m scheduling a few days offline this month to detach and detox. Don’t be alarmed, but please don’t hesitate to check on me while I’m striving to conquer the monster that invades my mind and dictates my moods: Success. The pursuit of its glory will not defeat me. I will win. To all my strong successful friends, so will you. Liltera R. Williams is a passionate Writer, seeking to use her words as a weapon for change and unity. She aims to inspire, while offering her professional insight on various topics surrounding Entertainment and Current News/Events. Her Bachelor's degree in Creative Writing from Florida State University led to a collection of over 50 published freelance articles and 4 self-published books. She blogs every time she is emotionally sparked by what's happening in the world and/or her personal life. For the average moviegoer, Us was a complex depiction of characters being haunted by their clones. For analyzers, like me, it was a masterpiece. I was so eager to see this film on opening night with my husband, although I'm not a true horror fan. Due to the plot's surface layout (zombies hunting down their enemies), Us could have ironically shared the title of his favorite TV show: The Walking Dead. 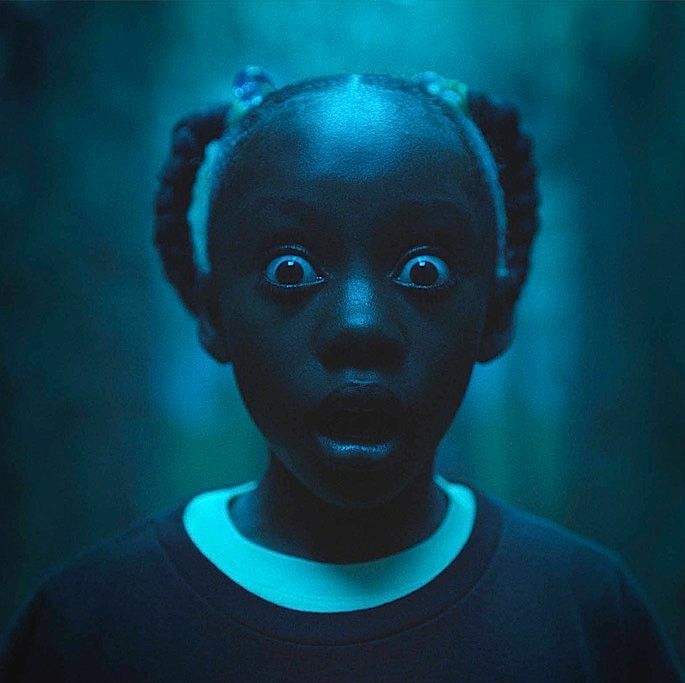 Throughout the movie, Writer, Director and Producer Jordan Peele dropped in numerous yet subtle clues that I was too captivated to recognize in the midst of my naivety. This seems to be the basis of his film-making deftness—keeping us so focused on the main points of action that we either overlook or ignore the underlying messages. The late 1980's opening was slow, dramatic, and calculated, introducing a young Adelaide (Lupita Nyong'o) in front of the television mesmerized by two correlating commercials, then attending a fair/carnival with her parents. After her father wins and adorns her with a Michael Jackson "Thriller" T-shirt, her mother urges him to keep his eyes on her while she takes a bathroom break. However, he remains caught up in the excitement of the carnival games and young Adelaide wanders off, firmly gripping a red candy apple (that she never bites into). For quite a few awkward moments, she's walking and observing her surroundings. Perhaps the most memorable sighting was a seemingly homeless man holding a piece of cardboard that read Jeremiah 11:11... "Therefore thus saith the Lord, Behold, I will bring evil upon them, which they shall not be able to escape; and though they shall cry unto me, I will not hearken unto them. "—The verse that everyone rushed to Google at the very end. By this point, the sun has set on Santa Cruz beach and Young Adelaide has stumbled upon a funhouse full of mirrors. When she enters, and suddenly leaves, she’s literally speechless and behaves as if she's seen ghost. Except, the ghost was her reflection. And it moved. When she didn’t. Her parents assume she’s suffering from PTSD because she got lost, never realizing that the little girl they actually raised was kidnapped by her "shadow", who switched places with her to become a member of the real world. Fast forward to Adult Adelaide vacationing with her family, The Wilsons, obviously traumatized by this childhood event. The audience meets her husband, Gabe (Winston Duke) and their two children, Zora (Shahadi Wright Joseph) and Jason (Evan Alex) while en route to their vacation home. Adelaide is visibly bothered and distant, but Peele insinuates that she's privately dealing with a mental issue rather than housing a well-kept secret. The Wilsons settle in and prepare for an upcoming beach day, although Adelaide is apprehensive about returning to the exact same spot where the infamous incident occurred. Gabe and Adelaide are relaxing on the beach chatting it up with their Caucasian counterparts, Josh and Kitty, watching their children have fun in the sun. It is obvious that Adelaide prefers to be elsewhere. When Jason goes missing (for a split second), she panics, they leave and Adelaide finally reveals the big secret to her husband. However, her memory is faint and in the middle of attempting to piece together her past, the plot skips to Jason letting them know, "There's a family outside... it's US." Doppelgängers wearing red jumpsuits and open-toe sandals, holding scissors against their chests: a rundown replica of The Wilsons. According to Red, Adelaide's double and the only one who can speak, this family wants revenge. In an Oscar-worthy monologue delivered profoundly via a ruptured tone, Red (Lupita) explains how Adelaide abandoned her and went on to live a life of luxury while she was a prisoner trapped in the underworld fighting to survive. How Adelaide was blessed with her prince charming and birthed normal children, and contrarily, she produced monsters—Umbrae and Pluto—with Abraham. Red then instructs her husband and children to harass their respective copies, which presents her with a one-on-one opportunity to confront and torture Adelaide. The action speeds up to hone in on suspenseful moments of each doppelgänger's pursuit, concluding with Adelaide and Red facing off in the place where they met, unveiling a plot twist that many (myself not included), probably correctly guessed from the beginning. In addition to its horrific elements, Us can also be classified as a psychological nail-biter that simultaneously paralyzes and frightens its viewers. It contains many do-not-blink moments and impels those watching to focus on the small gestures and hints in order to even catch a glimpse of what is transpiring. Bizarrely humorous scenes combined with a customized spine-chilling score and Hip-Hop inspired soundtrack allows Us to set itself in a category of its own. Peele is precise with his imagery and even more particular with his symbolism and historical references, most notably the extended Hands Across America metaphor that sparked the doppelgängers' takeover. Skillfully, the color red is splashed throughout as a sign of immediate danger (candy apple, strawberries, suits). And of course, it is the well-played name of Adelaide's twin. My brother also pointed out the intended use of symmetry (scissors, each family had two children and an evil half). Peele has indeed established a niche for creating mind-blowing cinema. The biggest lesson is the inference that we may hardly ever know the person looking back at us in the mirror; whether friend or foe, our reflection is sometimes a scary exhibition to acknowledge. Essentially, Us is a real “Thriller”, heavily inspired by Michael Jackson's classic video, that requires a lot of processing during and after a first watch. In my opinion, it may not be appealing to everyone, but to fully grasp the execution of the concept and appreciate the advanced allegory, it is worth a double-take. Pun intended. If you've seen Us, give MJ's video a few views and comment with the connections you're able to make. Also, rumors are spreading that, like his mother, Jason was switched at some point in the movie, or during a previous vacation. What do you think?